As the temperatures rise, pipes frozen by the low temperatures will begin to thaw. ALEXANDRIA, Va. – As the temperatures rise, pipes frozen by the low temperatures will begin to thaw. And while it may sound like a good thing, it could create plumbing nightmares. 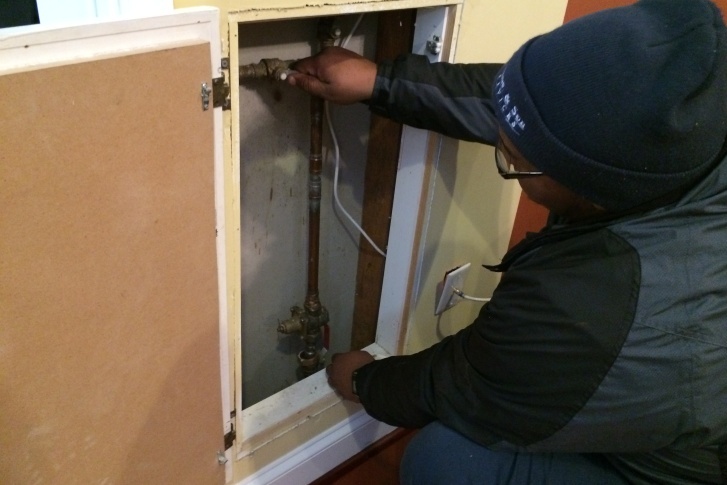 “Most likely, once it warms up and the pipes thaw out, then that’s when you’ll see either a small drip,” says plumber Marc Coleman of Michael & Son Services, who adds it could be even worse. By Tuesday afternoon, Michael & Son had 180 calls for frozen pipes in the D.C. area, Coleman says. One of the biggest culprits is outdoor hose bibs. Water lines that supply outdoor spigots should be closed and hoses emptied of water to prevent ice from making its way into inner water lines. Failure to do that can result in a leak or a burst pipe. “The water inside the hose will come back into your faucet and then burst the pipe that way,” Coleman says. Coleman’s best advice is to check for leaks. If there is a leak, shut off the water to the area and call a plumber. “If the water damage isn’t caught immediately, then that’s when problems start to mount,” he says. Kent Bacci of Alexandria, Va., called Coleman to his home because his downstairs faucets froze during the night. After turning on the heat downstairs, Bacci’s pipes thawed on their own with no damage done. Coleman says not everyone is that lucky and repairs for burst pipes can range from $150 to $450. And the cost doesn’t include damage to the home. There’s no proven technique that can guarantee pipes will be safe, but it’s important to shut off water to outdoor faucets before a freeze. Also, many water companies, like D.C. Water, recommend letting a faucet drip during cold nights so water doesn’t sit in the line and freeze.